In today’s virtualization space, amalgamation of computing and storage is the biggest trend that we see. 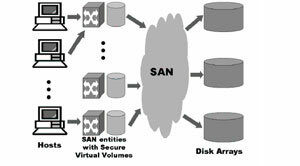 A virtual storage area network’s (vSAN) primary goal is to reduce the cost of storage devices and also reduce the input and output latency of network storage. When using hyper-converged infrastructure, x86 servers can be used with the physical storage, giving users a building block approach with the capability to scale-out as desired. VMware’s vSAN is a step in the right direction for software-defined computing, where the vSAN component’s responsibility lies in providing software-defined storage. To have a functioning hyper-convergence data center, users must ensure that at least one of the drives is solid state, as vSAN cannot function without a solid-state drive(SSD). The other drives can be regular magnetic hard drives; however, if all drives in the pool are SSDs, the vSAN will have more options for compression and deduplication. It is possible to create large data pools without the use of vSAN using external storage devices using an Ethernet-based Internet Small Computer Systems Interface (iSCSI) protocol. However, the tradeoff is, it becomes too complex to instantiate and maintain without any VMware support. As a result, complications can arise due to the conflicts when depending on multiple vendors. With the integration of vSAN components, users can eliminate the use of any third-party devices and software through the hyper-converged design if and when required. vSAN architecture has been designed to be vendor-agnostic, for potentially inexpensive configurations of servers. High availability (HA) can be maintained on the vSAN machine inside VMware or as an add-on, although, as an add-on, it introduces the complexity of inter-vendor conflicts.